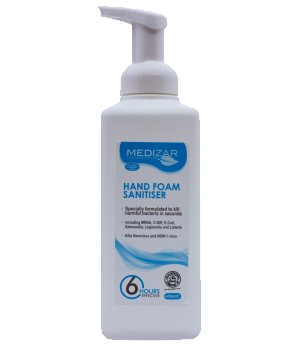 MediZar® Anti-Bacterial / Anti-Microbial Hand Foamer Sanitiser is certified to kill deadly E.Coli & MRSA within 30 seconds, and will kill 99.9999% of all bacteria, viruses etc which cause workplace and Hospital Acquired Infections. 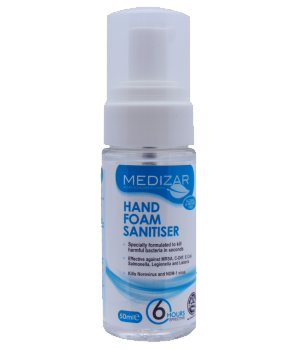 This 100% Alcohol Free foam sanitiser is gentle on the skin, smells clean & fresh and is non-irritant – yet offers 6 hours continuing protection against re-infection. In a handy 50ml size, this Hand Foamer Sanitiser will easily fit into a jacket pocket or bag for personal use.